SmartWool SW001323-924-S - Sock height: Over the Calf. With a light cushion leg and foot and flat knit toe seam. Light cushionlight cushioned shin and sole for impact absorption and warmthCareMachine Wash Warm Gentle Cycle. Do not Bleach. Light cushion shin and foot. Do not Dry Clean. Do not Iron. Keep his feet warm and your little ripper will be ready for more long after everyone else has called it a day. This warm winter sock gives kids the comfort and support to stay smiling after hours of outdoor fun. Flat knit toe seam. Style: sw001323. Tumble Dry Low. Smartwool SW-01345-$P - Flat knit toe seam. Sock height: Over the Calf. Style: sw001345. Over-the-calf socks. Self-adjusting welt cuff. Naturally antimicrobial Merino wool keeps feet odor-free. Medium cushioned shin and sole for impact absorption and warmth. Reinforced toe and heel. Y-stitch heel. Flat knit toe seam for comfort. 73% wool, 25% nylon, 2% elastane. Machine wash cold, tumble dry. Made in the USA. Light cushion shin and foot. Winter weather just doesn't know any better. SmartWool SW-01059-$P - Do not Bleach. Get ready for ski racing season with this lightly cushioned ski sock. Tumble Dry Low. Flat knit toe seam. Style: sw001345. Do not Iron. Style: sw001059. Do not Dry Clean. The power of merino helps keep little feet warm dry and comfortable for a full day on the hill. Light cushionlight cushioned shin and sole for impact absorption and warmthCare:Machine Wash Warm Gentle Cycle. Flat knit toe seam. Sock height: Over the Calf. Sock height: Over the Calf. Light cushion shin and foot. Thanks to its flat-knit toe seam, it's guaranteed not to let up on comfort while she hits the gates. Light cushion shin and foot. SmartWool SW-01325-$P - Flat knit toe seam. Style: sw001345. Light cushion shin and foot. Tumble Dry Low. Sock height: Over the Calf. Do not Iron. Flat knit toe seam. Do not Dry Clean. Sock height: Over the Calf. Light cushioning offers warmth without bulk and naturally antimicrobial Merino helps keep odors far, far away. Light cushionlight cushioned shin and sole for impact absorption and warmthCareMachine Wash Warm Gentle Cycle.
. Style: sw001059. Get your little woodsman geared up for a long, cold winter with these warm, breathable socks. Sock height: Over the Calf. Light cushion shin and foot. Style: sw001325. Flat knit toe seam. Light cushion shin and foot. Do not Bleach. Smartwool SW-SW190-$P - Sock height: Over the Calf. Sock height: Crew. Style: sw001345. Medium cushion: Medium cushioning to absorb impact on the trail. Flat knit toe seam. Flat knit toe seam. Flat knit toe seam. A smaller version of our classic hike sock for adults, the Kids' Hiking Medium Crew offers an elastic arch brace and flat-knit toe seam, keeping the sock in place without bunching. Light cushion shin and foot. Sock height: Over the Calf. Style: sw001325. Flat knit toe seam. Kids sizing: x-small Kid's Shoe 6-8. 5 - small kid's Shoe 9-11. 5 - medium kid's/Adult Shoe 12-2. 5 - large adult shoe 3-6 Light cushion shin and foot. Light cushion shin and foot. Elasticized arch brace. Style: sw001059. Sock height: Over the Calf. Past Season - SmartWool Kids' Hike Medium Crew - Style: sw0sw190 - knit in USA. SmartWool SW-SW626-$P - Do not Bleach. Style: sw001345. Flat knit toe seam. Sock height: Over the Calf. Sock height: Crew. Elasticized arch brace. Tumble Dry Low. Light cushion shin and foot. Do not Dry Clean. Ultra-comfy merino helps keep kids' feet felling good and resists odors. Medium cushionmedium cushioning for impact absorptionCareMachine Wash Warm Gentle Cycle. Light cushion shin and foot. Style: sw001059. Just like dad's version, this sock is the ultimate street trekker or jungle gym climber. Do not Iron. Style: sw0sW626. Sock height: Over the Calf. Medium cushion: Medium cushioning to absorb impact on the trail. Light cushion shin and foot. Style: sw001325. Sock height: Over the Calf. Past Season - Smartwool Boys' Hiker Street Socks - Sock height: Crew. Style: sw0sw190 - knit in USA. Flat knit toe seam. Smartwool SW-15018-$P - Flat knit toe seam. Sock height: Over the Calf. Sock height: Over the Calf. Light cushion shin and foot. Flat knit toe seam. Medium cushioning in Shin - front boot protection and Foot. 4 degree fit system - For all-day performance fit sock will not sag or bunch. Reliawool technology in High Impact Areas - To reduce shock and abrasion while Skiing. Moisture management - Wicks sweat away from the surface of the skin. Anti-bacterial - Reduces bacterial odours. Style: sw001059. Sock height: Crew. Targeted, medium-density cushioning in the front of the shin where your boots hit, as well as at the bottom of your foot helps you to ski more comfortably. Elasticized arch brace. AW15 - SmartWool PHD Ski Pattern Medium Women's Socks - Style: sw001345. Women's phd ski medium over-the-calf socks from Smartwool are great for skiers who prefer the mid-weight cushioning, while demanding a cutting-edge performance. Light cushion shin and foot. The ski medium socks feature Smartwool's 4 Degree Fit System to provide you with a perfect, long-lasting fit. Style: sw0sW626. Medium cushion: Medium cushioning to absorb impact on the trail. SmartWool - Medium cushion: Medium cushioning to absorb impact on the trail. Style: sw001105. Sock height: Crew. Flat knit toe seam. Flat knit toe seam. Style: sw001345. Do not Iron. Do not Bleach. Sock height: Crew. Flat knit toe seam. Light cushion shin and foot. Sock height: Crew. Tumble Dry Low. Flat knit toe seam. Style: sw001325. Style: sw0sw190 - knit in USA. Sock height: Over the Calf. Style: sw001059. Elasticized arch brace. Flat knit toe seam. Light cushion shin and foot. Style: sw0sW626. The striped hike medium crew fits the bill with full-length cushion, an arch brace, and a no-bulk flat-knit toe. Medium cushionmedium cushioning to absorb impact on the trailCareMachine Wash Warm Gentle Cycle. Past Season - SmartWool Kid's Striped Hike Medium Crew Socks - Do not Dry Clean. Medium cushioning in Shin - front boot protection and Foot. 4 degree fit system - For all-day performance fit sock will not sag or bunch. Smartwool B01212092. M - Their growing feet deserve the added comfort of the Smartwool® Striped Hike Light Crew. Sold as a one-pair pack. Crew sock sits at the calf. Sock height: Over the Calf. Sock height: Over the Calf. Flat knit toe seam. Elasticized arch brace. Style: sw0sw190 - knit in USA. Medium cushioning in Shin - front boot protection and Foot. 4 degree fit system - For all-day performance fit sock will not sag or bunch. Reliawool technology in High Impact Areas - To reduce shock and abrasion while Skiing. Moisture management - Wicks sweat away from the surface of the skin. Anti-bacterial - Reduces bacterial odours. Elasticized arch brace. Light cushion design provides ideal comfort over a variety of terrains. Smartwool Unisex Striped Hike Light Crew Toddler/Little Kid/Big Kid Deep Navy Medium - From imported yarn. Sock height: Crew. From imported yarn. Light cushion shin and foot. Smartwool SW001210-491-S - Style: sw001105. Wash with similar Color. Flat knit toe seam. Perfect for your little adventurer! made with anti-stink, super soft Merino and a flat toe seem to keep tootsies comfy, our Kids' Hike Light Crew is perfect for any adventure. Elasticized arch brace. Flat knit toe seam. Style: sw001059. Flat knit toe seam. Style: sw0sW626. Light cushion shin and foot. Flat knit toe seam. Style: sw0sw190 - knit in USA. Style: sw001345. Sock height: Crew. Medium cushioning in Shin - front boot protection and Foot. 4 degree fit system - For all-day performance fit sock will not sag or bunch. Reliawool technology in High Impact Areas - To reduce shock and abrasion while Skiing. Smartwool Kids' Hike Light Crew Dark Blue Small - Moisture management - Wicks sweat away from the surface of the skin. Anti-bacterial - Reduces bacterial odours. Elasticized arch brace. Sock height: Crew. Elasticized arch brace. SmartWool - Flat knit toe seam. Sock height: Over the Calf. Light cushion shin and foot. Flat knit toe seam. Style: sw001325. Medium cushioning in Shin - front boot protection and Foot. 4 degree fit system - For all-day performance fit sock will not sag or bunch. Reliawool technology in High Impact Areas - To reduce shock and abrasion while Skiing. Moisture management - Wicks sweat away from the surface of the skin. Anti-bacterial - Reduces bacterial odours. Elasticized arch brace. Designed to help keep your little one's toes nice and cozy, the Kids' Wintersport Yeti is perfect for winter adventures. Elasticized arch brace. Style: sw001345. Their growing feet deserve the added comfort of the Smartwool® Striped Hike Light Crew. 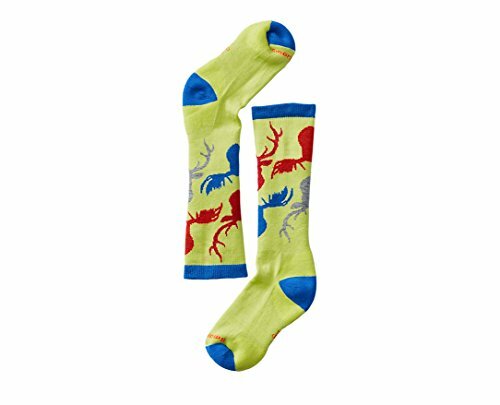 Smartwool Kids' Wintersport Yeti Socks - Sold as a one-pair pack. Crew sock sits at the calf. Light cushion design provides ideal comfort over a variety of terrains. Supportive arch band. Flat knit toe seam. 66% wool, 32% nylon, 2% elastane.